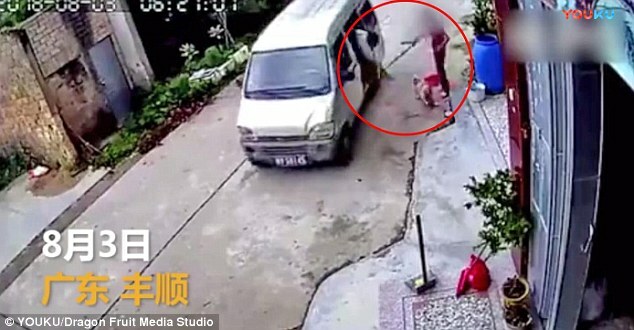 A pet owner in China has saved her dog from being snatched by a suspected thief with one simple movement. The quick-thinking woman who was sweeping the floor hit the suspect’s arm with her broomstick just as he was about to lasso her pet into a fast van, as a surveillance video shows. Her swift reaction, which happened in a split second, successfully prevented the pooch from being stolen in front of her house. The footage was filmed early in the morning last Friday. It is alleged that the incident occurred in southern China’s Guangdong Province. The woman is said to be living in Tangkent town, Fengshun county. Every year, thousands of pet dogs are poisoned and stolen in China, and as many as 20 million dogs are killed to satisfy the dog meat industry. Dog snatchers often drive a van and use a lasso to catch pet or stray dogs. Toxic darts are sometimes used too. In those cases, the thieves would go back to the location to collect the dogs’ body after they are poisoned. Dog theft is particularly common in southern parts of China, including Guangxi and Guangdong provinces. 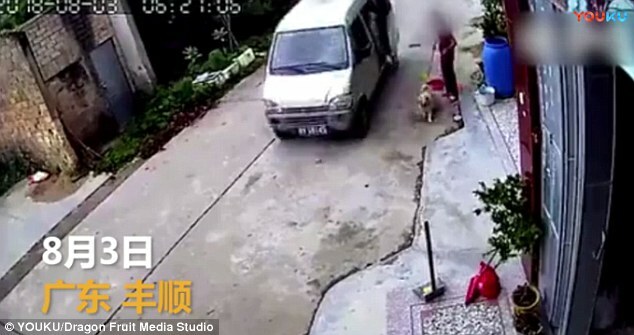 In February, a suspected dog thief was brutally attacked by residents of Fengshun after being caught stealing their pets. It was reported that the man sustained multiple fractures and the tendons on his hands were severed. One month earlier, a woman was tied to a gate and beaten by angry villagers in China after being spotted killing a dog using poisonous darts. Last year, Chinese police bust a gang based in central China that sold nearly 200,000 poisonous syringes to dog thieves across the nation through social media network. Wendy Higgins from Humane Society International UK said the practice of dog stealing is ‘too common’ in China and called for more attention to it. In a previous interview with MailOnline, she said: ‘It’s a cruelty that very often sees people’s beloved pets targeted, and the animals involved can suffer enormously. The stolen pet dog’s meat often ends up on the dinner table and their skin is used to make fashion accessories.